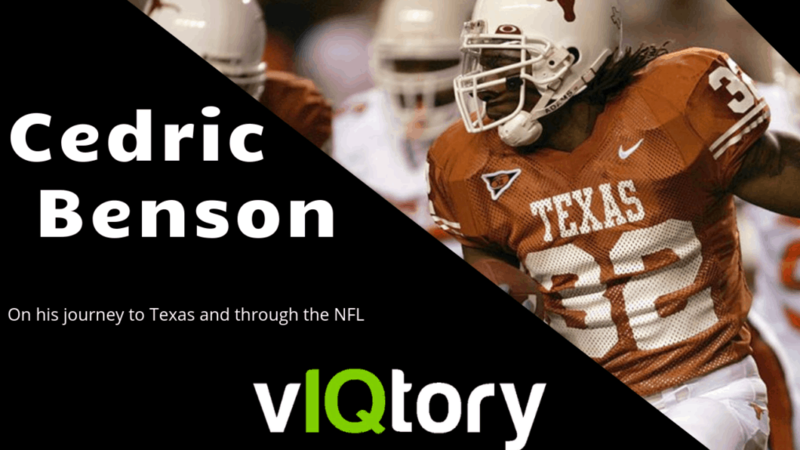 On this episode of the vIQtory podcast we are joined by Texas Longhorn legend, Midland, TX native, and 8 year NFL veteran – Cedric Benson. Cedric talks to us about his mental approach to football and how the business side of the sport shaped his career. He also details his journey through the NFL, how he overcomes obstacles, and about Nufced.org where he channels most of his time and energy. We encourage everyone to check out nufced.org at their website or Facebook page and help his cause. Welcome To The vIQtory Podcast, alongside, as always, Chris Haddad, and today calling in with us, we have Cendric Benson, the same Cendric Benson at Robert easily high school in Midland Texas, with the three times all american, finished with the fourth most rushing yards in Texas, high school history checks to think of all after that he went to University of Texas in that, along with 1st team, all big twelve selection, two thousand yards for senior year. Doak Walker award winner, contentious American and finished, as all time and division one in rushing yards after that in your career, the NFL we run through six thousand yards, played with the Bears Bengals and Packers. You know what I didn’t mention in there, but I think it’s something that’s really unique about you as you’re, also drafted a baseball player. I think it’s really special because a lot of the guys will be we’re finding out. They were multi sport athletes they weren’t, whether it was basketball, baseball or sometimes even three sports, like Jon Janson yeah. How much would you say you know just being obviously that’s just playing another sport. How did you ultimately, picked football and how much to being a really good baseball player help you become a better football player. You know being a really good baseball player, I wanted to address that first and foremost offers again at the end, but I’m being a good baseball player and going down the baseball amount of people that you know it’s on. That would be a good business man tell me how I was face was standing up to you know, a management or at an early early age and and having a stand up in to make a decision that would affect the rest of my life that early age. And I, and I really appreciate that journey down baseball. That are that are when appreciate those coaches. That whole experience on great do more just as from need and then we’ll. Small short little bit. More just as the meeting will ever do. But you know was, it was the high, how does a kid from West Texas, one three state championships and not play? You know you know, player right. You know right player in the state of Texas, not play football yeah. Thank you walk away from that. You know to go, play a baseball, rookie ball. You know what I mean it’s at the time. At the moment, you know it wasn’t it’s a it’s, a no brainer, it’s hard to walk away from that. But you know in hindsight, of course you know what I mean you can’t make a main who needs to be on the on the diamond today. She correct yeah, but the reality of the situation and then I’ll young kid making the man’s decision. You know, I’m I’m glad I made that decision and brought us where we are today. We had a lot of great story to tell about it. You know, and. A lot of good things come from it so, but you know if there was ever a time, I could recharge it all again. Knowing what I know today, you know the chain that we always say you’re right. We only know what we know today. You know, as you alluded to you, you made the choice in, and it seems like in August one, maybe at the time being highly ranked recruited, you did decide to play college football. You know I wanted to ask of course, Texas, kid University of Texas, I’m sure it’s not, but could you just walk us through you know how early will you being recruited to play at the division one level and even when that you had offers from all over the place? How did you go through that chaos in the ultimately pick Texas? You don’t like the complicate things it was pretty easy for me. I’Ll play so much football and for both so being was so much of it traveling. So much I mean we would take Trips out to El Paso to play a football game, get up, play a football game, drop right back. You know what I mean I’m in those were six hour trips. So are we once once went out to Louisiana Lafayette, You know got the bus played football game drove over that we were rolling. You know we’re going through those state championship runs, so I was wore out and by the end of the season and so to imagine traveling all these places and meeting all these strengths. Folks. That you know. Just really didn’t you know, I don’t know, mess will remain been awhile, young kid after playing football season. So many things really simple. Yeah look look. I got a hold of Ricky Williams, between the years of my cousin turned me onto him. He will bring a lot of tapes over and we will watch old my two thousand one, two thousand two years of high school or no,t I’m sorry, sorry, ninety eight ninety nine years of high school. Two thousand and I just got really hooked, and I saw myself being a successful, and you know do emulating myself out there. So I really appreciate it for all his hard workers and he was driving force a firm out myself. Various we fast forward to you ultimately choose the Texas Longhorns. As steve mentioned at the top of the show Doak Walker winner, for those who don’t it was a nation,top running back, consensus. American finish, your career with five thousand five hundred and forty odds, rushing attracts six all time or individually history. Only second to Ricky Williams in team history – talk a little bit about playing for Mack brown. I believe Vince Young was there when you there as well right yeah. what was it like playing for Mack and those guys? Over you know we came in a and a challenged with some things early have to work really hard to prove still have to prove myself, which I appreciate it. I want to talk about when it comes to not assuming the job is done and in always working harder. You know I was challenged early on you know. People said hey. You may not be good enough to do this or you you may not deserve to start. Week or be this, which is what I needed you know, the so I got rushed and challenged early. So I appreciate that you know it’s funny when your kid you’re going through it you’re, not aware of, and I don’t even think, they’re aware of everybody’s just making decisions. But these decisions that we live with that we do affect every body every single person involved and then the third type away, and it’s so interesting to reflect on that stuff. So it was pretty neat, nine and then what bench came in. I mean that’s when things really had to change, because he was a a young kid who’s. There’s a lot of spirit, and you know either you’re going to look this pure flourish or you’re, going to put a cap on it in and not get the best out of it. In the bank, we had a great job and letting it fires and shows are really things got really find towards the end up off into my college days. And you guys like that and guys like yourself to you just got to essentially, let them be themselves and let them do what they do best, for you is around the football and if you mentioned, was just to make plays ultimately right and a little you know and I mentioned all those. You had a a University of Texas, is there any favorite memory or our favorite moment that sticks out for you are playing football? It’s actually without a doubt as the it’s actually game, a church, the games, a lot of fun on the Oklahoma State game we’re down, but like. I think twenty seven points in time on like that and so we came out and ended up winning the game and it’s pretty interesting we are, a Member everybody’s been was a celebrating, but it was almost as if the game was like, we were allowed to touchdowns from here on out. Nobody was dripping sweat. Nobody was worried about anything and it was pretty neat to come out the second half and take care of business. So it’s just a great thing to be apart of, yeah. Those college games are that long. I think people realize that when you have, you know that much time on the clock and it’s not just run it there’s there’s always a chance in college right like having that mindset of half that we’re all right. You know. Oh, so you know all your college accolades as we’ve already mentioned once they they’ve wrapped up. You know you’re sitting as one of a highly touted NFL prospect. So you actually end up getting drafted number for overall, or you had a little bit of a contract situation. You weren’t able to get your first camp, I’m as early as some of the other guys. You know in hindsight, when you look at just a rookie year by Chicago, how Much to situation affect you just being able to hit the ground running with which situation, not being able to get the camp of. I think as early as soon as the other guys. Yet I think it was it could have been. It was challenging a little bit just because you got to catch onto the plays and things like that. But you know they had an a runner back. There Thomas Jones, and you know you know. I don’t know, I was a man on a mission, Fans though I was a detriment, much of a detriment, anything I’m when you and then, when the end it when you get into the NFL or you’re engaging. I mean when you get into college or engaging into a business, and you want to sign a contract, but when you get in itself, it’s almost it’s more real or you know it’s you, you are involved in in big business, and so I don’t know what the stipulations were there, I can’t really say whether they would have been. Do you have a good draft, a story or you’re in New York right for the draft, a garage? Do you any any good stories come through? I saw a picture I was just when are we doing the research this, looking at draft class loaded with guys like Alex Smith, Ronnie brown, Demarcus ware or Aaron Rogers. Where so, I mean to be sitting in a room with all those guys. You know and guys like that so to just all that talent that room. I’M, you know what was that they like you being drafted? It was good, I mean it was. It was interesting because you know your business because I can say you. You’re in a different world, you know it. It appears in it seems fine and you know everybody’s, getting jobs and making money and things like that, but like stuff, that’s the thing that s*** that’s what’s happened. You know we’re not talking about football. You know they were talking about draft status as we’re talking about drop position’s we’re talking about contracts are talking about money. I were talking about all these things outside of football side of the game of football, and so that that’s it that’s. What that is that’s not football. You know, and so you know you come into a young man, taking that’s football and you find out pretty quick, just awful and and that’s the way. I you know. I think just to you have fun playing college. You have fun play in high school and then also the NFL business right and run what you’re not I mean. I guess you were exposed to a little bit with the end all be stuff in the Yeah I absolutely but but but then on on the same since. It’s fair to say to their business just ran a little bit. It’ a little more integrity, I’m a part of there negotiations and things like that, but I don’t think nobody’s trying to squeeze you went to some minutes before why you shouldn’t have the draft taken minutes before they pick a you know, I’m. So you know you you. You know you, you are really good football player. The have to learn to be a really good businessman very very quickly. You know three years later after you get drafted, As your time in Chicago’s coming to and then by the years afterwards, you’re quoted saying no year in Chicago was happy. Just looking back, you know hindsight being twenty twenty, what was it about the whole situation that just really wait on you? Well, I mean think about it. I mean I’m a young man, I’m from Texas, I’m from Chicago on this. Up there, I don’t know anyone up there. You know I’ve never been. I don’t know anyone in your common thing that happens in the industry every year with every player, I’m even probably would change and other industries Coca Cola, but was there anybody there’s contract dispute and then go, and so a young men coming into this who’s now is the experiences first contract dispute and it goes from a who’s, been picked. Your team coming into your city and just to be challenged by the to have the I think you you, you’re you’re up against a bigger animal. I do try to make a lot of decision based on the best outcome for your life and the barriers are. The city is just trying to make this decision for the outcome of the entertainment or their business right, your lights involved, they’re entertainment as state, and so you know big push up just being pushed by the media. On in my career, just kind of got Shunned has a kind of a I guess a bad guy for trying to negotiate a deal. You know what I mean I get the best for business, and you know they kind of gave me a hard time about this. So you know you end up. I get there I show up, and then you know there’s a in terms of just having a good season, and so you know your channels they throw that in mass into things up, and so it’s just like in my career, never really got a respectable start. I didn’t care for the hoopla, but I guess they wanted it so that yeah they created it. You know whether it’d be the contract or whether it be the Thomas job, the running back or where whatever’s needed so I had to deal with it and people received it as reality right they just shown those issues to really be real issues right and then sometimes even players fall for the stuff that they read the paper to watch the news everybody’s got a TV in house and so you know sometimes even players software to make it there Yeah and so now, you’re stuck in this world when a crafted doesn’t have anything for Mm hmm, yeah yeah right yeah. you know, you’re now you’re able to sandwich whomever you want sign with, do you remember what opportunities were out there in free agency? Not many had already been kind of in Austin was the town than what school and was trying to make. You know to be some figures so they’re. Writing in the papers much about me to that didn’t help me and my favorite and then there’s aware, as well as my struggles inch Chicago just kind of didn’t know the this big image of you gets created. This for this and everybody sees it should be who you are. You know. Nobody Knows you nobody, regardless of your success, is once you’ve done the idea of you overcome the reality of your best powerful and into may just need. The source. Are electrical college sorcery like to call this starting to give me the link and all kinds of other stuff, but I’m a topic, oh, but I ended up on. I don’t even know where we are totally was not to build another world. ]Cincinnati yeah we’re talking about a but yeah. Like I say, I got there and I’m like I said, there wasn’t very many options, so she gave me an opportunity and they were fair to me at the time I guess for what I had gone up against my a persona at the time I guess, as they will fair to me, and so I just make the best of it in, and it was just football, like they wouldn’t have the team they had a lot of players. Who you know what I mean you know. The worst thing. For what we’re trying to find their roles in that spot a and then it was easy for me. That was my second one. Was anything different about your approach, is it just the training differently or approach? I don’t mind a challenge and they’re going into that Cincinnati, a Yeah Yeah, I’m definitely filling underdogs for sure Yeah Yeah, and this is a lack of respect for sure I’m feeling. Like I, my opportunity was concerned in Chicago. Given I finished just make a stance and show everybody you know with you know, it’s not a game out here. I am, and why I’m, good at football and I’ll show it to you so that’s what I did it so good to do that and I didn’t care if it was if it was on the Bengals. Didn’t care if I make sports center or nobody heard about I didn’t care you know. I know that Sunday and that the end of the day I was proud and happy to but I do that again. You know. Yeah and you certainly do two thousand nine hundred and thirteen games is your best year as a pro. A and we’ll talk a little bit about that year to the only claim that thirteen games. Rushing for twelve on your guys to talk about that and how you’re able to you know you’re in there now you’re establishing this up as the go to guy a and then you’re able to rip off to the year you had, but ultimately show everybody that you know, you’re still the same guy you weren’t Chicago same guy came out of Texas. You know that you’re, like. You know it was easy. It was fun. You know yes, basically small on a test that I mentioned earlier when we first started. This was assuming that you haven’t worked on and not just work my a** off yeah. You know just like a test in school, just like, I didn’t high school and that’s. That was a you know. Flash forward, a little bit here. Twenty-Twelve you signed with Green Bay, I’m at that point you’re, creating a you know. What was most important is you signing with Green Bay? Was it just getting an opportunity to keep going, or you know you get the latest stages, your career. You know there was a mindset on so that the months they’re going to that is that Mark roots, probably about. Oh, you know you come off come out of since she you know for straight seasons to play. You have no no reason not to get offered of the deal, and I go home , im on the Couch all sitting pretty and that’s where I’m lost. You know, get a call one day from a one or coaches and they’re. Like hey, are you still home and I’m like yeah, like what you know, like yeah, I’m thinking the same and ensure that the next week you know Green Bay call. But you know it’s like a league minimum deal after having all the success I had in Cincinnati. So that’s kind of hone in on locker. It’Ssprobably you know what I’m trying to offer me league minimum, probably summing up with them in your half and see. If you know what I mean end up back up for. Prove everybody wrong and then just off you know, but that just kind of wasn’t my style, so I was like all right well, I guess I’ll go ahead and kick a** and show them that they disrespect. You know that right Yeah Yeah, and I was only going to do it for like a season or to just quit. You know what I mean and or so, but you know the Lord saw that plan is like hey. Let’S do it earlier than that. So I got got out there got started job in was up to this done and delivering Andrew monthly.That’s it Yeah and walk away, because I knew it was coming in or no no there’s no charge walk away from it. Should I mean it seems to be you had a real big chip on your shoulder. Deservedly show yeah. How without that you think you have the same type of career I mean she was like. Need you to go go back to listen to the podcast like I mentioned, because. Remember when I talked about UT and all the challenges, the challenges we have, which were message or what the time the same thing apart and then I don’t know all those challenges when necessary. For me to have the outcome. I I mean for me out of success, or you know those are those all just challenges in the game. You know the game, it’s just a game. You know, but what you do what your time when I’m doing those challenges, yeah yeah? Those challenges have me get the best that much on the ship. Looking back to you say, it was the most challenging part of playing football and the so would it be more just handling it having to understand the business side of it, or is it more. Note From your football experience, and you have to work hard to make sure you maintain that focus and, like I say you can have it all and you can have successful careers. As you mentioned, you know we kind of had that reset button. If you could go back in time and you’ll go between the baseball football. I a similar type of question, though you know if you could go back and talk to whether it’s twenty one year old Cedric or eighteen year old Cedric. Yet is there any specific it bye see? You would give us your what’s to come and how to best deal with it a man you know, I’m will be. I want to get something that I think is really cool and there’s a little bit more up to date in your place. Where a let’s talk about Nufced.org, your organization, you just some really cool things this summer, but I want you to just get out there. So we could take you know, the communities, donations and then put on a camp for those communities, I’m as well as bringing it educational piece. I’M, I want to put. On my vision is to come to the city to put on an elite, our performance got what we get on appealing we’d definitely trying to put them awesome jobs to specific careers, that aremaybe needed. We want to also bringing a doctor, maybe a lawyer and have a classroom session where they have a Q. a with the doctor and they’re logging in questions on what is like, you know to Dr would like to be a lawyer what’s a typical day or how how did you become a doctor, a lawyer, or you know? Let’s just get that on the education of light, do sports thing? First and hopefully they forget about it on the educational piece that we keep in mind so what we want to try to develop much more Ah lawyers and much more on doctors and much more and scientists and things like that in our communities. That way we can empower ourselves within our communities. Depending on you know, a couple of needs to be a doctor’s, a scientist, and you know I coach high school football yeah local high school. I always tell the kids you use as a bridge to get to where you want to be right. It’S not the end goal if it’s that bridge data education right, we are you doing this going to teach you the tools to make you stronger than the next line in the work for exactly what I mean. And that’s on top of a free training camp, a sessions that you had a mid went over the summer, I’m totally great start really cool. If we wanted to introduce ourselves and just going to get out there and just kind of show what we can do on. The sports you know there were we get back on them and implement the educational piece to on the so that’s awesome. So for everyone which listening now set, is spelled, nufced.org for the website, but if you’re able to search and Instagram. Are we also got a Facebook handle on on Facebook and that’s about it and then we’re young we’re just starting now, I’m taking a slow and we appreciate any support awesome well. I hope that all those things go up. There follow you, and I know we’re we’re. Definitely happy to watch you and see how this thing grows, but before we let you off the hook. We got to get you to go to the. power offense, power. You control the clock. Going back to your playing days, which would you prefer, went over a camera when over. Oh, is there any one coach or or team that you wish? You could do it all over again that you would have had a chance to play with a place for a down at the bureau started our arts. when I was in Cincinnati, the Dodgers came into town and a lot of those coaches approach me down and where people happen to be up into May, just on a new right away. When I saw him, I was like well, you know I’d be here with these guys too, so just need to see them so we’ll have nice to have experienced that life, those guys and gone up that journey. Close game or shoot out. which more important the Scheme or the players? Players – without players they can’t execute the scheme. We really appreciate the time!